Pure Coconut Oil infused with Ayurvedic herbs. Divine Love® Lustrous Ayurvedic Hair and Body Oil is a complement to a beautiful body. This oil enhances healthy skin and lustrous hair leaving a lingering natural fragrance and a sensual feeling, invigorating the mind pleasantly. Divine Love® Lustrous Ayurvedic Hair and Body Oil is used and liked by all, especially loved by women for maintaining and enhancing their physical beauty and luxurious hair and to retain their youthfulness. 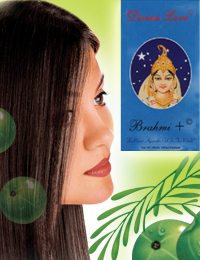 Divine Love® Lustrous Ayurvedic Hair and Body Oil contains ingredients like Brahmi, Valo, Damaro, Amla, Nagoda and Sandalwood extract in a pure coconut oil base and is best for all skin and hair types. Direction: Massage Divine Love® Lustrous Ayurvedic Hair and Body Oil into hair and scalp and all over the body.